Big thanks to everyone who visited The Non Review on Monday for my guest post on B-movies. My buddy George at CineMarvellous! just celebrated two years blogging and two hundred followers. Congratulations! If you’re into movies (and hopefully you are, as I talk about them all the time and you keep coming back), George offers the best movie reviews around. Elizabeth Spann Craig at Mystery Writing is Murder also just released an eBook this week! Elizabeth is a big-time author and Progressive Dinner Deadly, a Myrtle Clover mystery, is available in eBook form for the first time Only $2.99! I think it'd be a good idea. I'm sure the blogosphere can support a catharsis the likes of which has never been seen, and it could provide support to writers who really need it. I'm all for encouraging other writers. Go for it. I can' imagine making it this far on my journey with out some of the amazing people I've met along the path. It would be great to pass the love on to others. Great idea, Alex! Count me in. Thanks for the mention, Alex! You've mentioned me and my blog so many times already, I can't be grateful enough. Seriously! Just one small thing though... It's "CineMarvellous", with double L (We've studied British English at school, and British people spell it with double L) :) Plus, it think this hybrid word look better with the double L.
Thanks again for the kind words, buddy! I think it a good idea Alex. One has to feel secure in what they're writing about , self confidence if you have it is a wonderful thing, if you can pass it on to others all the better. Have a wonderful "Viewing" day. Ciara and Suzie - great! Yvonne, I will make it so! Great idea. Where do I sign? Another great sounding book I'm going to have to check out - thank you for sharing! 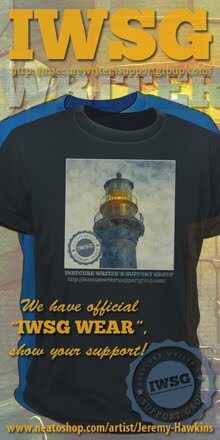 The support group is a great idea, and definitely more cost effective than therapy. "Lord make me the person my psychiatrist medicates me to be!" I think it is a swell idea! And I'm a therapist. I could've used it last month. When do we start? I say adopt a kitty!! They're excellent therapists and know when your time is up! LOL! But seriously!! Yay for this fab event!! I'm all for lots of hugs and cuddles over the ether! The more the merrier. Ahem. I picked up Craig's book yesterday and can't wait to get into it. I'm sure I'll like it just as much as her previous Myrtle book. I like the idea of the support group. Sometimes I feel, because I've been blogging awhile and because I've been picked up by a small publisher, that I need to be strong for the writing/blogging community but I know I have days of doubt and insecurity. I think the club is a fantastic idea. I think that that's a very good idea! I think there are plenty of people who need support to keep writing. I'd love to help out! Great idea, and the name is perfect. I'm in. I love supporting other writers ! Hello. My name is Heather and I'm an...insecure writer hoping to one day be an...insecure published writer. Writer's Support Group? I'm there, man! My wife is fond of saying that insecurity is the biggest problem in the world. I kind of agree. Heck to the yes on the Insecure Writers Group! Hilarious. We can totally make that a meme. It's a group I could be president of. Would all the possible stories of rejection and despondency get one down? I don't know. But I know one kind word of support will keep me going for weeks. A therapy day? LOL. I'm all for that. Had to send a friend a therapy request letter yesterday asking for writer insecurity help. So, yeah, I'm in. I think it sounds like a great idea, but it might be hard to write supportive things if you're in one of those moods where you're in need of support yourself. JUST a thought, and doesn't make the idea any less great. I think we could all do with knowing we're all in the same boat! Fantastic idea, Alex! Go with it. I'm never insecure. Wait, wait - what if that sounds stupid? Everyone needs a hand now and then. Knowing you are not the only one helps one to reach out. I hereby dub it INSECURITY DAY. Sometimes it's better to give than to receive, so even on a really crappy writing day we can stretch ourselves by encouraging each other. I think it's a brilliant idea, Alex. Great idea! Would some writers be too insecure to join? have a great day mister! it's gorgeous here - blue skies and lots of sunshine! I am feeling insecure about a lot but not so much the writing (wait til my book comes out in 2 months tho and that will change). Anyway, add me to your group. I can use some therapy LOL. I think this is a great idea! We all are going through our personal trials and tribulations, and words of encouragement can go a long way. I say yes! I WUV this idea! Make it work, Alex. You have such a big heart, you ol softie... I think this is a GREAT idea. I have seen so much doubt too across the blogosphere lately. One thing we ALL need to do is keep positive and KEEP AT IT! I don't know, Alex, what would I post about, and why would anyone want to read about my problems, and what if people don't like me or think I'm stupid, what if I reveal myself to be the fraud that I am...oh, wait. I think it's a grand idea. We all need a little encouragement now & then. I know I'd never be able to make it over the bumps without the support of my fellow writers. They keep me going. Insecure Writers Support group? To me, having a group to angst with helps. I belong to a large writing group--we've been together almost 5 years and we've had almost 500 continuous conversation threads that go to 300 comments and then someone else post an article. We do a lot of support and encouragement. We have quite a few pubbed authors (probably over 30% of our members)who share their knowledge too. Funny thing is, when we started out, none of us were published--all aspiring. One of the reasons I set my blog up the way I did was to show the commonality between writers--regardless of genre. Authors talk about their triumphs but they also share the problems they're facing or have overcome and how. Many of the authors I have on the blog are bestsellers and you'd think they were problem free in their writing and you would think wrong, lol! Alex, I'm going to look again at your blogfest guidelines. Maybe I can do a Monday-which is my day to blog. BTW, if you need a review on your new book, let me know. Neurotic? Writers? Well... maybe a little. That's a pretty cool idea Alex. Everyone needs a little encouragement now and again. I dunno. Sounds like too much drama for me. the group is a good idea and I would gladly contribute to it. The ebook looks lovely, adding it to my Kindle pile! I'm torn on the idea of an insecure writers group. One one hand--the honesty and support would be beautiful. But..but I would hate to see it turn into a complain fest. And that would certainly make me stop reading because I don't read blogs that are constantly complaining, being negative, etc. Now that I think about it--I probably wouldn't participate because I have enough self doubts just sitting here by myself--reading others would probably push me down a spiral. That said--it sounds like a lot of others are very interested in the idea, and I'm happy to support it in any way I can without actually participating. It is a very interesting idea--I love the way you think about things, Alex. Always with this sense of community and how we can help each other. I love it! Any chance to air my neuroses under the guise of therapeutic interchange is exactly what I need. Catharsis for everyone! I do love the idea. The whole reason I joined the blogosphere was to find other authors who had gone through similar situations and connect with them to see how they got through it as well as to tell my own tale of woe. Kitty, how much does Charlie charge for therapy? Thanks, Laura. I try to stay upbeat! Sarah, we'll make it happen then. Yvonne, that's why I hope we don't all post downer stuff on the same day. Might disrupt the universe. Journaling, I think you might need it. Jessica, that's why there's an either-or option. Milo, I'll make it so! Michael, who you calling soft? Sia, thank you! Will keep you posted on that. Thanks, Heidi! That's why I hope half of the blogs are encouraging rather than just down. I'll try not to be one of the down ones. Not often anyway. Mark, George's site is awesome and so is the man behind the blog. Great idea! I'm all in. Writing is so solitary and rejection can crush a person's confidence. We have to stick together and uplift each other to keep the good karma flowing. Neurotic? You say writers are neurotic? Never would have guessed. Could be very effective and work both ways. Reaching out and supporting others is such a positive experience that it can be therapeutic for your own temporary doubts or negativity. I like it. Alex - You really are awesome!!! I think it's a great idea too. I'd like to suggest that "writers" is broadly defined. See, I'm insecure about calling myself a "writer" because I'm not a published author. And I'm insecure about being seen as "less than." I still have some great insecurities AND encouragement to offer, though. RaShelle, we'll just have to try it and see what happens! Robyn, if you write, you are a writer! Authors are published. So you're good to go. lol You just read my mind. I've been having what I'm terming a 'confidence crisis lately'. I think it'd be a great idea. It might affect the balance of the world and cause a change in the tilt. Or ... It could be a day of sharing and reaching out to others. I dunno. A tilt sounds fun. So is this just a lonely heart's club for writers or can copywriters apply too? Mary, sounds like I was just in time. Helen, writers tend to tilt anyway. Copyboy, you are always welcome! Elizabeth, does this mean I did good? Stupendous idea, Alex. Where do I sign up? :-) For every 3 positive thoughts I have, there are days when I seem to have 5 negative ones. Writing is just a tough, tough self-concious business. Lifting each other up is very important. 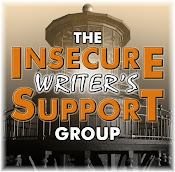 If I was a writer, I'd love the idea about having an Insecure Writers Support Group. Everyone can benefit from it. Writing is therapy in and of itself, a writers support group - sounds great! A support group for writers? Sounds necessary. No time to comment here...I totally forgot to go back and read your guest post...now I am off to do just that...and comment there! We all have our doubts and hopes so it might be a good idea to share. Since a lot of bloggers write about this already it would be cool to put it into some organized effort where we all have a common focus. I like the idea. Good idea. Encouragement bolstered with the occasional tip would be helpful. And thanks for the tip on Elizabeth's book. Supporting others during their lows times is invaluable. Personally, I have a few closed forums I visit to really let it all out. I'm not sure I could do it on my blog. Nicki, I think it will be encouraging. Found you through Girl Wizard, and am enjoying your blog! INCREDIBLE idea. Insecurity is a secure resident in my mind, especially when I open my laptop. I think connecting with the only other people who can understand is the only way to get through this! Wow, you must be my Ninja Godfather; yes I would love to have an Insecure Writers Support Group! You can kick me with kindness :D Great idea; artists need encouragement especially when their really world isn't so supportive. That sounds really good - you can never have too much support. I often find that the most insecure writers are also among the most supportive, so this would be a damn good way to get them to come out of their shell a bit. Haha, I now picture the entire blogosphere in one collective mood swing... But in all seriousness, I don't think that would be the result. After all, most people react with others' despair with trying to cheer them up, trying to help. So I guess the collective mood would be much more likely to be a happy one. I've only ever found support groups to be supportive - never gloomy or negative. I'm an optimist, anyway! Ella, the Ninja Godfather - I like it! Thanks, Melissa - I try. Cruella, as long as it's a positive mood swing, I think it will work. I dont know. I have plenty of insecurities and complexes to share but would it help? Or would it become a sob story only I am interested in hearing? Thanks for the heads-up on Elizabeth's book -- I just bought a couple of the Riley Adams books but am way behind on Myrtle Clover's adventures. Ha! I'm a lousy friend! Totally didn't realize Elizabeth's book had gone up! And I think that insecure writer's idea is a good one! I think it gives us all heart to see fears conquered. I am not a writer but I am pretty insecure, so much that sometimes I'm up two hours deciding what pictures I put in the post for the day. I must also admit that I feel very rewarded by your support in the comments. Thank you very much Alex. Now that's a really great idea! I think it's an awesome idea!! Everyone always thinks "I'm the only one" but seeing others who have the same fears, doubts, and concerns as you is always a help at least to me..not only that but having a fresh pair of eyes is always a good thing. Sometimes you just need to talk it out to see what was right in front of you the whole time. You are super awesomeness!! Great idea!! Thanks so much for the mention, Alex! I really appreciate it! I think all writers have such a difficult time with confidence. It must be because we receive so much criticism with critiques, the query process, editing, and then reviews. I think you've got a great idea! Huntress, someone will relate and be able to encourage you, I promise! Heather!!! I am all over that. Leovi, you are welcome, and you have amazing talent with a camera. Sounds like a great idea! Count me in. It sounds like a very encouraging idea to me Alex! Love the idea. Everyone needs a strong support network. Thanks, everyone! We'll make it so. Li, I'll check it out. is there a link? rusty and i wanna know! Most of the things you plan turn out being pretty awesome, Alex, so I'm sure it would work out. Who needs therapy when there is the blogger community :) Yeah, I think it a good idea, I'd join. I'm really behind in my blog reading - I'm still technically on a break for a beta read - but I've read through your last couple posts. I don't get around to Rusty or Damyanti's blogs as much as I'd like, but I've been intrigued by both books. Thanks for the recommendations. And I'm so glad you liked the Planet of the Apes movie - I'd see it anyways but your review just makes me want it more. Great idea Alex. I'm glad it took off. Hey Donna! Go see it - movie is awesome. Ed, I bet the answer is all of the above. I know I'm responding to this rather late but the Insecure Writers Support Group sounds like a great idea.